It’s the season of mists and mellow fruitfulness, and that can only mean it’s time for the Aylsham Food Festival. This year, music, magic and memories are on the menu at the ever-popular three-day event which returns in October (from Friday 5th to Sunday 7th October) with a packed weekend of old favourites and family entertainment. Headlining the festival will be one of Norfolk’s most celebrated chefs, Richard Hughes (top). The proprietor and food campaigner will launch the festival at An Evening with Richard Hughes (left) at Aylsham High School on the Friday, 5 October, when he will talk about his 40 years in the heat of the kitchen – from pot-washer to proprietor of The Assembly House and the Richard Hughes Cookery School. Alongside regular features like the Country Market, Farmers’ Market and Slow Brunch will be Norfolk favourite, folk musician and cartoonist, Tony Hall, the walkabout musical act Banana Ukulele Band and magician and children’s entertainer, Robbie James, who will all be on hand to entertain visitors to the party. The programme kicks off a week earlier with a ‘fringe taster’ — Rosie With Cider, on Friday 28 September at the town hall. 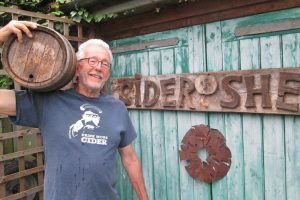 Father and daughter David (left) and Rosie Warren, from Aylsham, will demonstrate the art of cider-making using a cider press – accompanied by Tony Hall (right) on melodeon. The festival proper starts on Friday morning (6 October) with the weekly Country Market in the town hall where you can sample a wide range of home-baked, home-grown and home-made products. 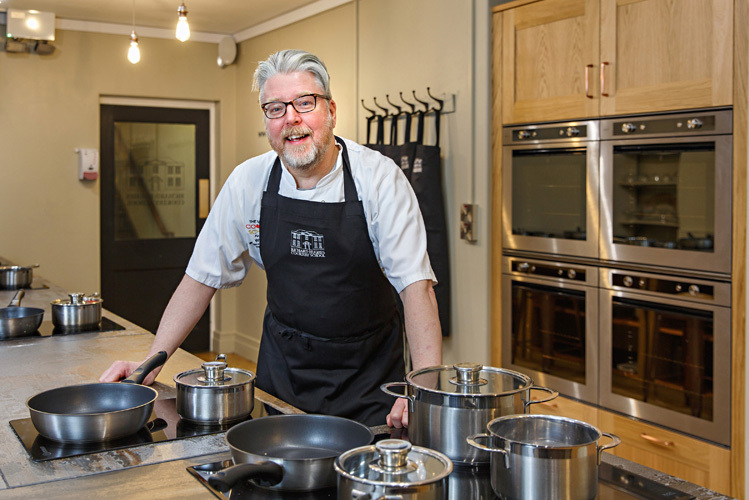 Later, it’s An Evening with Richard Hughes at Aylsham High School which starts at 6.30 for 7pm and includes a supper of beef and ale pie or a vegetarian option prepared, cooked and served by students at the High School. There will be a licensed bar. Tickets are £15pp. 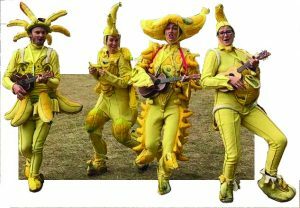 On Saturday morning, come and say “Yellow!” to the Banana Ukulele Band as well as jazz from local band, One Foot In The Groove, who will entertain visitors to the regular Farmers’ Market where chef Derrol Waller, will give a cookery demonstration. Or go inside the town hall where there will be a variety of attractions for both adults and children. Saturday evening is devoted to wine tasting. Led by Brian Sullivan from Harper Wells wine merchants of Eaton, sample a selection of wines and cheeses at the Heritage Centre at 7pm. Tickets £17 per head from the Heritage Centre. The Big Slow Brunch on Sunday not only features the famous all-you-can-eat Full English fry-up and Continental buffet, but be amazed by the sleight of hand demonstrated, at your table, by magician and children’s entertainer Robbie James (left) – so perfect for all ages. Catered and served by members of Slow Food Aylsham at the town hall, this family event usually sells out fast, so don’t delay in getting your tickets, at £7 per person.